Hollow beads are all the rage this year. At last week’s conference my tablemate Libby Mills applied her own distinct style by carving and doodling on the hollow forms with Prismacolor pencils followed by a wash of black acrylic. She paired the beads with wire wraps that echoed the scribbled look. You may notice that scribbling has been a theme of Libby’s for years. This new design may push her back into the studio to play again. I saw these on Libby’s FB page the other day – love them!!!! I love Libby’s work, it’s always fresh and her sense of color and design are outstanding. She has always been very inspirational and a great influence for me. When I saw her work on flicker years ago I thought I have got to try working with polymers clay! WTG Libby! You have to show these t us at the next guild meeting! Hey Lib – these look great in the picture and everybody loves them! Hope it inspires and energizes you for the future. Really nice, Libby…congrats on this new style – super cool! Libby is the Queen of Scribbles! Hey Lib, I still wear the neon green scribble earrings I got from you more than a few years ago! I almost beat out Linda W to own this beauty! It’s stunning in person. Congrats to you Linda, wear it in great health! Thanks Cynthia & everyone! It certainly felt good to get my hands into some polymer clay. The cotton bead forms from Filigree & More were fun to play with, even though removing the core is tedious. Hollow beads are strangely satisfying. I’m still playing with the technique as far as color goes. I was aiming for some of the intense color with hints of black background in some of Marjorie Schick’s work, but I think the current result is very reminiscent of some of Bettina Welker’s current work. In any case I am determined to continue playing around with the possibilities and not stay out of the studio for so long again. 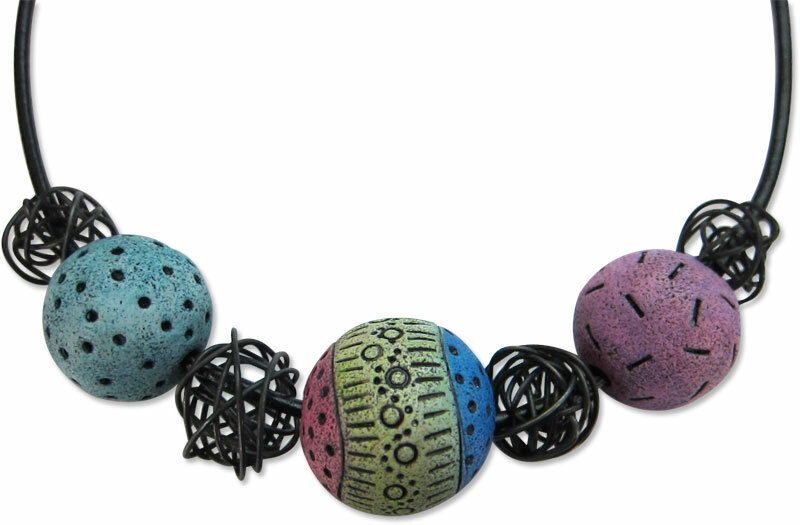 how can i learn how to make the round hollow beads? Is there a tutorial? I know how to make the lentil ‘two sides glued together’ type… but if this is a different method, I’d like to buy a tutorial…. or get a ‘hint’ !